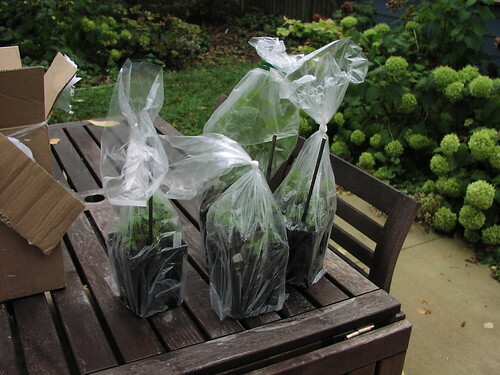 Are these not the happiest little plants you could expect from mail order? I’m used to getting horribly messy boxes with plants that look half-dead when I order native plants online. 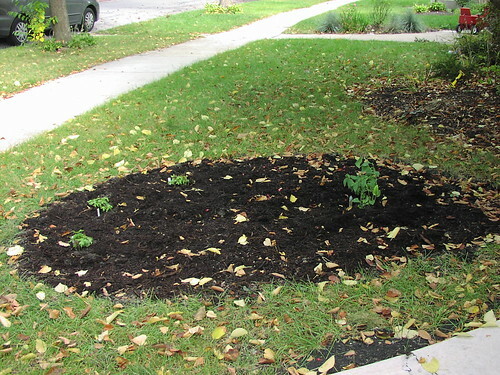 (Yes, with time and water the scrawny little plants do tend to start looking better, but not always.) 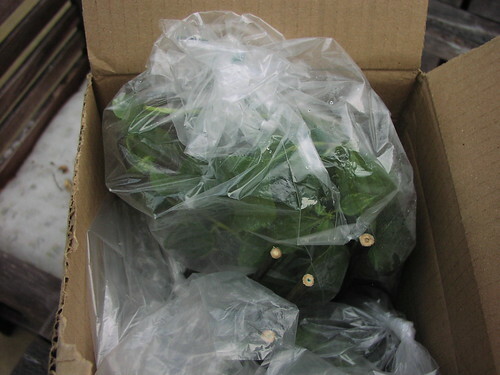 Every time I order from Stone Silo, I get very healthy plants that thrive right away, and a minimum of packing material as well. A plastic bag and a bamboo stick are a lot easier to reuse or toss than a pile of wet newspaper or excelsior. Here are the plants (3 Canada anemone [Anemone canadensis] to the left and a sweet black-eyed Susan [Rudbeckia submentosa] to the right) in the new rain garden. I can’t recommend Stone Silo highly enough for people in the upper Midwest who are looking to buy native plants. They’re building a very nice collection of woodland plants in addition to the prairie ones, so it’s a good place for urban gardeners with a surplus of shade. The camera is now back in town, so I can capture the early signs of fall in the garden. I really like these dark sunflowers, although I’m not sure whether the birds will like them as much as they did last year’s Russian Mammoth. The Virginia creeper (which is actually native grape woodbine Parthenocissus inserta/vitacea, I believe, since it has tendrils rather than sticky disks) along the edge of the pond is starting to turn red, as is the blackhaw viburnum. However, the water lily is still blooming and the pickerel weed is still sending up the occasional flower. 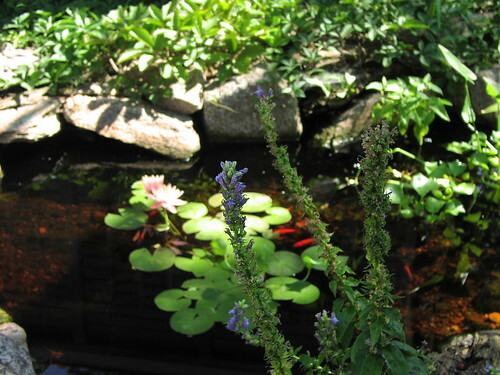 I was a bit puzzled in mid-summer when I saw no baby goldfish or shubunkins in the pond. Last year, we had little fish by July 4. But good news: there’s at least 3 baby shubunkins in there now, swimming with the rest of the fish. There may be baby goldfish, too, but since they’re black, they’re hard to see when they’re tiny. As for last year’s fish, there seems to be a quota on the goldfish turning gold. Only one of the black ones will change color at a time; once it is completely golden, another will start up. There are still at least 4 that are still completely black – perhaps they were spawned at the end of last summer and are not old or large enough to turn. The two shubunkins spawned last year are mostly white with splashes of gold. I’m hoping for a little black on some of this years’ fish since it seems like they’re not really shubunkins unless they’re calico. Alas, my camera is in China with the spouse, so no pictures today. I’ll link to the pictures I’ve taken in the past month, and take some make-up pics next week! habanero chile – just picked 3 orange ones this week! I noticed a couple of weeks ago that the Virginia creeper (Parthenocissus quinquefolia) had grown out of control and was starting to climb up the garage siding. I cut down the errant vines and trimmed down the remaining ones on the garage trellis so they weren’t getting close to the siding or to the Dutchman’s pipe vine. I thought that was sufficient…. But then I saw a couple of leaves poking out of the corner of the garage. Further inspection showed several vines snaking up under the bottom of the siding along the whole west side of the garage. Big ones, too – at least as big around as my little finger. Why the creeper is so enthusiastic about growing up into the dark under the siding I don’t know, especially since I’ve spent the past two years trying to get it to grow up a wood fence (in the shade, sure, but not as shady as that!) without any success at all. So I cut all the vines I saw growing up the side of the garage and will patrol for them until we get a freeze. I wasn’t able to pull many of them out from under the siding, but they should dry up and fall out….unless they’re conspiring under there…. 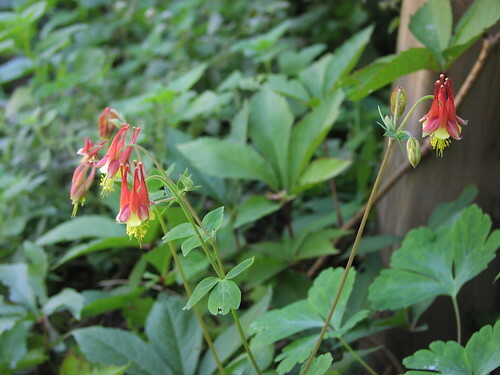 The columbine (Aquilegia canadensis) I planted in the spring didn’t bloom then, but it’s blooming now! 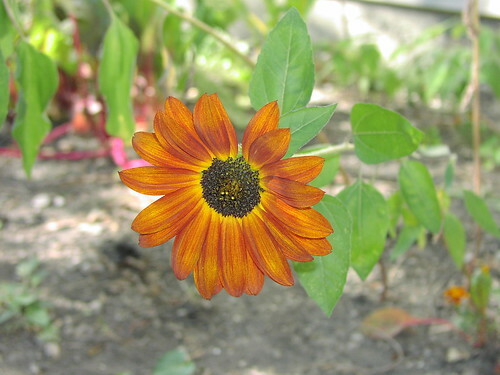 Late August and early September seem to be a second springtime for some of my native plants. Not only is one of my new columbines blooming, but also the Dutchman’s pipe is sending up new leaves for the first time since early June. 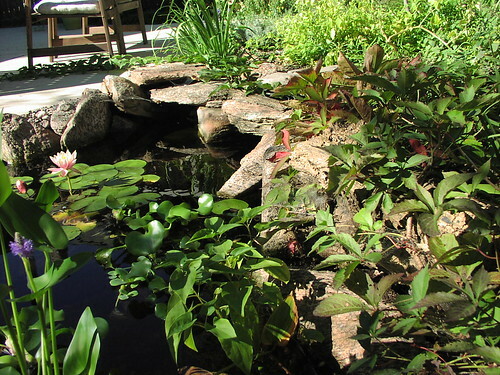 (This happened last year as well, as shown in my Pond Evolution post.) It hasn’t been a particularly warm or dry summer, so that didn’t keep things back. I’d say it was the torrential rains of early and mid-August, but this has happened before in years without such a deluge. So I think I’ll chalk it up to the natives taking advantage of the fine clear weather we get here in September and October! The last of the lobelia blossoms, with the pond in the background. Even though the water hyacinths are HUGE this year, they’re not blooming and I’m not motivated to take pictures of a bunch of uniform green fleshy leaves.